All I can say about this crazy dance dome is,... you're welcome! Your kids will go bannanas over this new inflatable. Check out the YouTube video!! 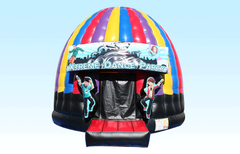 This Xtreme Dance Party Dome rental includes a 4000 watt sound system, flashing colored lights and a cable to connect to your iPod or MP3 player. It is also bluetooth capable.